It is not about nationality or religion. There are certain icons embedded in one's subconscience; however one may try to raise oneself out of the confines of the country and belief system that one was born into, however universal one is, the spiritual umbilical cord with your nativity cannot be cut. Icons such as Ganga, Himalayas, Kasi, Bharatapuzha, etc, are so ingrained in me; I find great solace in them. I consider myself an Indian just because I have been fortunate to be born in this land. If I consider myself a Hindu ( which I don't, in the religious sense) it is only because of the historical and spiritual baggage that I carry as an Indian; anytime better than an American or British baggage! Below is an unpublished poem I wrote long ago. I was in Varanasi, with my mother's ashes. I was not there due to religious reasons; I had never before visited this place and my mother's death was an excuse. During my 4 or 5 days stay in Varanasi, I wandered around the city, watched bodies being cremated, visited BHU and the Palace across the Ganges. Despite its filth and crowds and ugliness, Benaras/Kasi/Varanasi left an indelible impression in my mind. 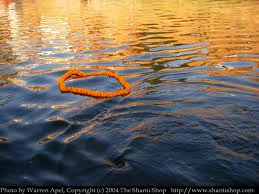 I wouldn't mind visiting it again; I would love to sit on the banks of Ganges on a full moon night, alone. Kasi/ Benaras/Varanasi. The ancient, holy city in India. Since ages, Kasi has been the final resting place en route heaven – or hell. Amidst the stench of putrefying land. What do I take from thee, Kasi? For me? Just you in my heart. Benaras, of the dilapidated palace? Or Varanasi, the leprous one? Into this vortex of Hell? Your ancient soul and shadows. Touching the cool stones with my heart. I let flow at Vasudhara1 Falls. To you, to never return. If only it were you, Kasi! Who still run in my blood. What my son would be. A waterfall near Badrinath, high in the Himalayas. Though I have not been there, writings and word of mouth from people such as you have given a tantalising glimpse of the place. Perhaps there must be only one reason for Kasi to be as she is. To magnify the fickleness of life and conceit of man. And I guess that may be a possible answer to your ask. As human beings we are a sum total of the realisations we accumulate as we go through life, realisations that our ties with the land bring us face to face with. India is a geography of the mind in as much as it is a geography of a terrain. Varanasi is magical. It forces one to face up with oneself in ways many other places do not. Kind of heating up thoughts here. Of all those feelings you unwrapped there,remarkable is the one where your longing to be the ONE you really are and WANT TO BE the original at least there with Kasi.It seems Balachandran,however we enjoy the life in earth and experience the survival thereof, the unseen slavery is what we want to get rid of. After all the thrill of a belief or such a place is what we can take it from..The way you extract it for you ! I have not been there but I have heard a lot. Maybe the place stays to remind us of our temporary being. To reflect the reality of life.